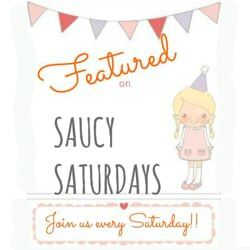 Welcome to the Saucy Saturday blog hop everyone!! Now that you are here, feel free to share your blog posts, visit others and make new friends. Seems we bloggers are well into apple and pumpkin mode and swiftly moving into holiday season. We’re loving all your cozy comfort food, ingenious decorating ideas and the DIY Halloween costumes (especially the tiny ones) bring huge smiles to our faces. Thanks for sharing your creativity with us here week after week. If you’re new, welcome to the party! And, if you’re just in need of inspiration, you’re in the perfect place. Take a look around and enjoy yourself. Now go on to the end of the post and start adding your posts. We so love seeing your links here that we wanted more. To that effect, we are now keeping the party open All Week long! Yes, Saucy Saturday will be open from SATURDAY 8am EST all the way to THURSDAY 00:00 hrs (midnight). Tell your friends and hey, come join us..
Share your posts, explore other links, and bring a friend to party along! But first, meet your hosts. Swayam – from LA PETIT CHEF – “banker and a trained classical dancer, I spend my days running after my 3 yr old, reading novels and pottering around my garden. I love a good laugh, friends and a witty conversation”. Jennifer – from TAKE TWO TAPAS – “wife and mother of two boys. Hoarder of food magazines and can’t finish my laundry”. Dini – from THE FLAVOR BENDER – “Permanently caffeinated chocoholic , mad scientist in the kitchen and former audiologist, now living my dream of constantly making a mess of the kitchen”! Now let’s see what the hosts bought to the party! Get ready for the shout outs too as we will be reposting some of your posts randomly on our IG feed!! Do join us there and tag us #SaucySaturdays to share your party posts!! Tag @lapetitchef, @theflavorbender @taketwotapas @bklynxtine on Instagram/Twitter and Facebook. We would LOVE it if you guys could spread the word the party. Simply share on FB, Twitter, or Instagram using the #SaucySaturdays hashtag! FEATURED THIS WEEK – Congratulations to all our featured bloggers!! We are proud to play host to such awesome friends. Don’t forget to visit them and leave a comment! Looking forward to many more such rocking and happy parties this year. Keep cooking, creating and sharing with us guys.. We LOVE it. If you were featured at our blog hop today, don’t forget to display this cute little badge right here on your blog! You know it will look adorable. Join our Facebook group and share your recipes with a broader spectrum of audience! Just click on this picture, and then click on the Join button when you get to the Facebook group. Remember that every feature is shared on all Host’s and Co-Host’s blogs, as well as on the Saucy Saturdays Pinterest Board! Don’t forget to follow Saucy Saturdays Party Board on PINTEREST. So, Are you ready to PARTY?? This link party starts every SATURDAY 8 am and goes on till Thursday midnight, EST. At Saucy Saturdays we love meeting new people and discovering new blogs, and we are so thrilled to have you here with us! Help us grow this party into a huge gathering of friends by inviting a friend to join you this Saturday and sharing about it on your blog. The easiest way to do this is by displaying our badge on your sidebar. And we wanted to thank you guys for spreading word about us and making us such a hit! It simply wouldn’t have been possible without all you amazing people. Most welcome Michelle!! Needless to say we were craving it even as we featured it!